When we first looked at ukassignmentshelp.co.uk, we got the impression that this site looks familiar. Its design was unique and professional, but the features we evaluated brought us to a conclusion that this website is one of the several sites created by one company. If you want to learn what they offer and which are these websites, read on. James Kendrick: I don’t recommend ukassignmentshelp.co.uk. I’ve been writing this everywhere I can because this company is a scam service everyone should know about. Their writers missed my deadline for a couple hours, sent me a half-plagiarized paper, and took no responsibility for this at all. I got no refund, no revision, and no apology. Yvonne Copper: Ukassignmentshelp.co.uk is my friend’s favorite service, but I think she needs to re-check her criteria. She convinced me this is a great service, but when I ordered, I got a low-quality paper. I can think of several other companies that do better than this within the minute. The Services page on the website is not full, but do not expect a lot from the actual list, either. You can check this list in the ordering form or the ‘request a call back’ form on the homepage. Once you do, you will learn that this company offers quite a limited range of academic services. To be precise, they offer 11 types of services that include essay, coursework, thesis, dissertation, research proposal, etc. The lack of some of the most popular papers such as research papers, articles, and movie reviews makes us believe that this is not a good candidate for a content provider. 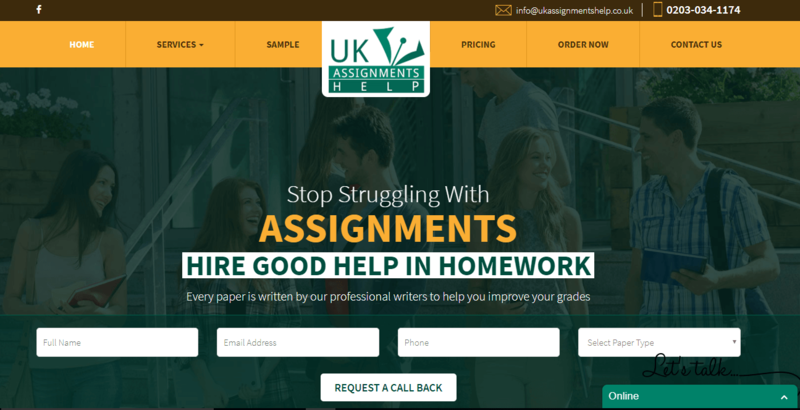 The prices at ukassignmentshelp.co.uk are extremely affordable, but they are actually what lead us to the conclusion of the other websites we mentioned. If you take a look at the price table here, and those of ukwritingexperts.co.uk, britishassignmentshelp.co.uk, and britishassignmentwriter.co.uk, you will find the exact same price list, with even the same table design. As it turns out, these are all sites from one company and serve to trick more customers into ordering from them. While this is a clear problem and a sign of a scam service, all websites seem to have customers’ reviews online. This indicates that the company delivers the papers. The starting rate here is £8.99 per page for 2:2 Standard quality, followed by £13.99 per page for 2:1 Standard quality, and £18.99 per page for First Class standard quality. The company has only 4 deadlines options, which is a bit of a disappointment, mostly because the shortest timeframe you can order within is 24 hours. As is the case with the other websites, there is no discount offered here. Except for the occasional special offers, this company has no set first-time discount that you can use to try out the company at a reduced cost or a loyalty program you can enjoy once you become their regular customer. The lack of the first-time discount is not so serious, especially since feedback online suggests this company often has such special offers on the website. However, the lack of a loyalty program is a serious problem and one more reason why this company is a bad candidate for a regular provider. Unfortunately, as is the case with all unrealistically cheap services, this company also delivers low-quality content. In this case, the content may have been better if the writer was better in English, because while the ideas and sources were great, the writing was terrible. We found dozens of mistakes in our content, and a lot of it was fully incomprehensible. The next step was to contact customer support. Yes, the website is extremely easy to use and all information is right there for you to see. There are also samples customers can check, but these are nothing like the actual essay we got from the company’s writers. When we got in touch with the customer support regarding the problem with our paper, we got an immediate response from their agent. The agent did a good job in informing us about the revision policy and approved our request almost immediately. The customer support here is great, but we cannot say the same about the writers. Even after the revision, our essay was of low quality. Overall, we are looking at a company with cheap prices, but the low-quality content and bad writers. The customer support here is excellent, as well as their website, but the fact that this company sells papers by using a variety of different names is very concerning, and a sure reason to stay away from this provider.